I was on the fence about whether to see the new film, “Crazy Rich Asians,” based on the book of the same name by Kevin Kwan. Then I heard there was a mah jongg scene in it. That decided me. I even arranged a movie night with my mah jongg buddies so we could all view it together. Since I hadn’t read the book, I only had an idea what the story was about based on trailers I’d seen. What a delightful surprise! Not only was it a classic romantic comedy (boy meets girl, boy loses girl, boy and girl reunite), it also featured incredible views of Singapore and more glitz than Oscar night in Hollywood. The cast was superb. Little did we know that it would be a pivotal point in story where the girl challenges the boy’s mother, who is opposed to the girl marrying her son, to a game of mah jongg. Although two other women were part of the game, they had no lines. Thank goodness they played with the tiles I’m used to (more or less, they were slightly larger and no tile bore a number), because their version of the game differed considerably otherwise. Still, we were able to follow what was happening: (spoiler alert) at one point, the girl draws the winning tile but discards it instead, so the mother can win. The game represents their test of wills. There’s very little running commentary on the game for the uninitiated. The scene spoke for itself. How brilliant to utilize the game begun in China in the late 1800s as the turning point in this film that takes place in Singapore. 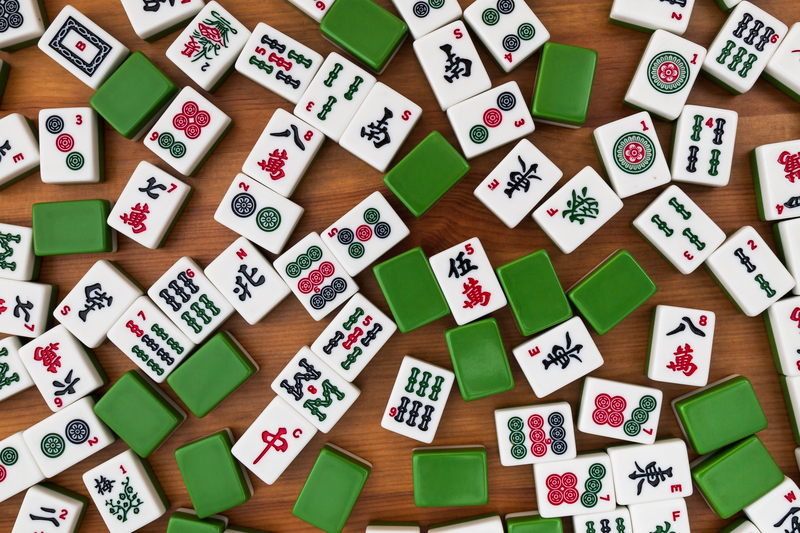 White-green tiles for mahjong on a brown wooden background. No empty place. I, too, use the game of mah jongg in my stories. 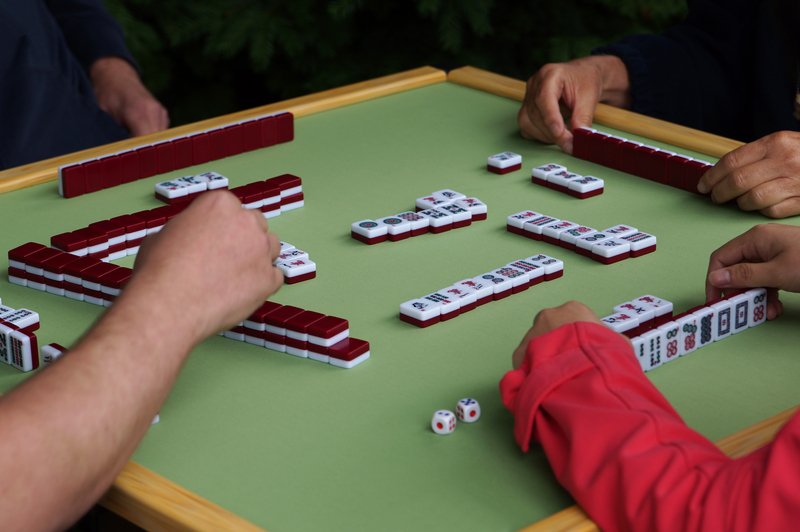 The four protagonists of the Mah Jongg Mysteries are aficionados of the game and play together each week, when they’re not investigating the latest murder in the central Florida town of Serendipity Springs. I’m so pleased to see the game appearing elsewhere.